Whether you are looking for a fun packed family day out, or catching up with friends and colleagues - bowling is a great way to team up and enjoy a day or evening. 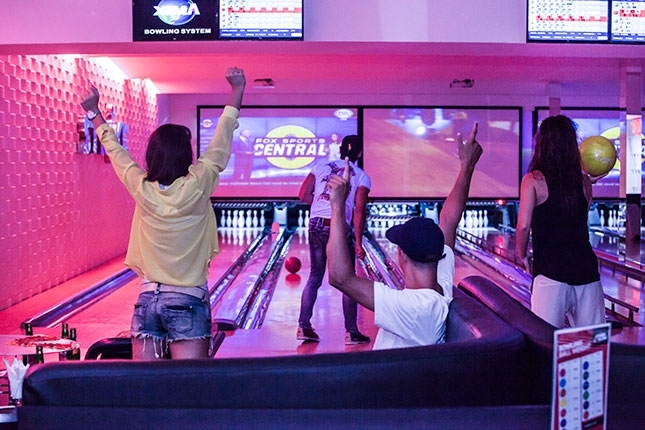 Strike offers the latest, most modern tenpin bowling experience in Bali. We have 6 lanes with automatic pinsetters complete with a computerised scoring system, meaning keeping score isn't a chore. There are bumpers for the kids (or anyone else!) to stop the ball going into the gutter. Offering varied entertainment options - themed nights, birthday parties, corporate events, bucks parties, date night or just a fabulous place to connect with family and friends. Shoes are included. Bowlers can wear own socks or purchase for Rp 20,000 per pair. Each lane can accommodate up to 6 people. Additional charge RP 50,000 nett per person. Prices are inclusive of tax and service charge. Packages are available for those planning birthday parties, corporate events, bucks parties, hens' nights, Christmas parties or maybe a party for no reason at all!